Courtesy of Ram Barkai, Lake Baikal, Russia. The world's deepest lake, Lake Baikal, is considered to be among the world's clearest lakes. Ram Barkai explains, "You tend to forget that you are in the middle of Siberia, just north of Mongolia, slap bang in the middle if remote Asia. Winter temperatures can plummet to under -40°C and that lovely 636 km of water freezes to a solid 1 meter or more of ice, during the winter. 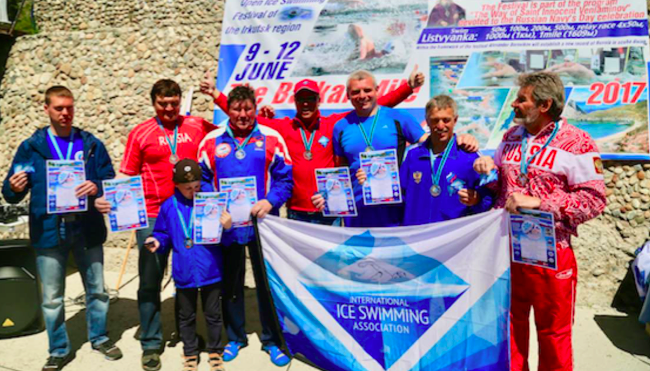 I was invited to join the Russia Ice Swimming Festival in Lake Baikal. Just getting there is no simple feat coming from Cape Town. There are no shortcuts. It is 5 time zones east of Moscow at around 53° North. I finally got there by 4 am with my daughter Kaitlin. She is on a month's leave from her gruelling job around the world and somehow, I managed to convince her to join me and explore. She loved it. The Russian food, the people, the swims, it was a wonderful mind (eye) opening experience. Despite being the beginning of the summer, the water temperatures were at around 4.6°C the whole time. Listvyanka, the little town one hour from Irkutsk and the region's capital, is situated in the open area of the lake where water simply never goes above 8°C. I never expected the water to be below 8°C, hence I didn’t plan to complete my 10th Ice Mile here. To my pleasant surprise, the water was below 5°C the whole time. The real purpose of the visit was to attend the event, educate about the ice, and offer an International Ice Swimming Association official's course. 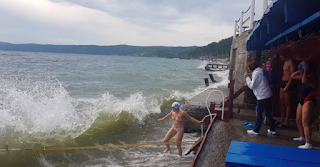 The Russian are very familiar with the ICE; however, they are much more cautious with it than the ice swimmers in Great Britain, Ireland or South Africa. Possibly because they live with it most of the year, they respect its danger and hostility, and the idea of swimming a distance in the icy water without protection is simply against their survival instincts. They are used to neoprene, two caps and sometimes even gloves. Safety in this environment is something that gets drilled into you from Day One. Living in a country that gets to -40°C is not for the faint-hearted. The Russian’s are not scared or weak, they are as hard as nails, they don’t get scared of a challenge. They simply do it. The first day an onshore wind picked up and made the swimming rather difficult - aside from the fact that it was 4.5°C. Nonetheless, the men and women turned to their heats and swam. Not all were strong swimmers, but they liked the challenge and the ice. The water is so clear you can see the bottom all the time and with a rescue boat with Russian medical team, all dressed up in dry suit gear, we felt safe. On Day One, we all swam 50 meters and 100 meters. I find these distances harder with my asthma. It is a sprint and with the icy water shutting your chest, it basically only opens post-swim. No time to adjust and relax. The next day, the wind disappeared and this pristine beautiful lake was there ready for us. It was time for the 200-meter and 500-meter swims. I hate the 200 meters. It is a sprint in the ice. I basically can’t breathe for plus/minus three minutes. I finish feeling like I was held under a massive wave unable to get air. For some it is a long distance. For us, open water and long distance swimmers, we need 2-3 km to open up and warm up in a normal long swim. In the Ice, I need around 300 meters to start feeling comfortable. I know it sounds like an oxymoron, but with experience, you learn how to adjust to the ice, not fight it. The numbers started to drop, not everyone likes the 500 meters, if you are not reasonably fast 500 meters could mean over 10 minutes in 4°C water. It starts to get interesting. I believe everyone can swim up to 120 minutes in sub 5°C. It is just experience and no panic (being able to swim helps as well), but once you approach the 15 minutes, 20 minutes and 30 minutes, things change in the ICE. The next day was the 1 km swim, I usually feel relaxed about 1 km. It’s a distance I am comfortable with and not stressed. Around 10 of us swam and I could see some are starting to get cold. The swim was hard. I couldn’t get my breathing right and I was competing with Sasha Malinki, another great Alekander (all Alekander’s here are Sasha). He was a 64-year-old swimmer, strong and fast and he kept me fighting out of my relaxed zone. Needless to say, an hour later when we discussed tomorrow's mile, I realised I simply had no choice. I swam faster and better than most of them, but not all of them. I recovered very well, yet they were all so committed, I simply had to change my mindset and commit as well. The mind is a wonderful thing. Once you convince it that something is possible, it simply becomes one. An Ice Mile is, my 10th Ice Mile. I hadn’t planned it; it simply happened. The next day, we were explained the course. I am used to understanding around 10%-20% of what is going on in Russia. But I learnt to trust them 100%. It was only seven of us swimmers, and two ladies with fins and a small wetsuit. We got on the police boat to the start. It was a long straight line along the shore. As we approached the start point, the boat just carried on. I said few flowery words in Afrikaans to Kaitlin, but we just continued to go. That 'mile' suddenly seemed like two. When we stopped, my heart was busy recalibrating my mind. It looked so far away, I nearly lost my nerves. Luckily the weather was so beautiful, the conditions were perfect, and nothing else aside from my mind [was there] to stop me. I had a quick chat with my mind, instructed it to get into shape and stop whining. I spotted several objects along the course and broke the course down to smaller and manageable distances. I dived into my zone, quiet, focused, and no talking. It is visualisation time. Visualising the start and the breathing, getting my chest right and wait for it to open up before I start pushing. I decided to close my eyes so I don’t let myself distracted by the other swimmers. For me, an Ice Mile is a swim against yourself. You almost swim with an imaginary partner to pace you. You mustn’t let anyone else break that strategy, it may kill your swim. The swim was surreal, like swimming in a frozen coral reef. I took a dog leg right course. I am not sure why, but it looked like the right thing to do at the time. After 500 meters, I was swimming above this deep blue abyss with visibility just going on forever. It was breathtaking and scary at the same time. I swam alone the whole way. I didn’t see a boat or other swimmers until the last 100 meters. Apparently, the boat was right behind me. The swim was icy and long. 30 minutes of stroke after stroke. My hands were frozen after 300 meters and my useless legs just dragging behind me like a floating anchor. Mentally, I reminded myself to kick every now and then; however, physically, I was never sure if it really happened. I finally saw the end. I heard screams in Russian, but had no idea if they were related to my swim (of course they were...but my frozen mind was elsewhere. Some like to think of Ice Mile as harder than anything...comparing it to English Channel or other running adventures. I like to see it as a very personal challenge. None of them is easy and they don’t get easy as you get fit. You just handle the recovery and the fear better. You have experience, but it is never easy. Some of my miles took me to dark scary place and some took me to deep places. It is all in your mind...just make sure you prepare and safe. The Russian Ice Swimmers never cease to amaze me with their spirit, their comradery and support for each other. Respect. I know, from experience and from seeing them - that first Ice Mile has changed their life. In some positive way, forever, it changed what is possible for them even at ages of 65 years old. I could see the new respect they have gain for themselves, that I did it, I conquered my fears and I prevailed."